Help us send another 20,000 posters around the country. 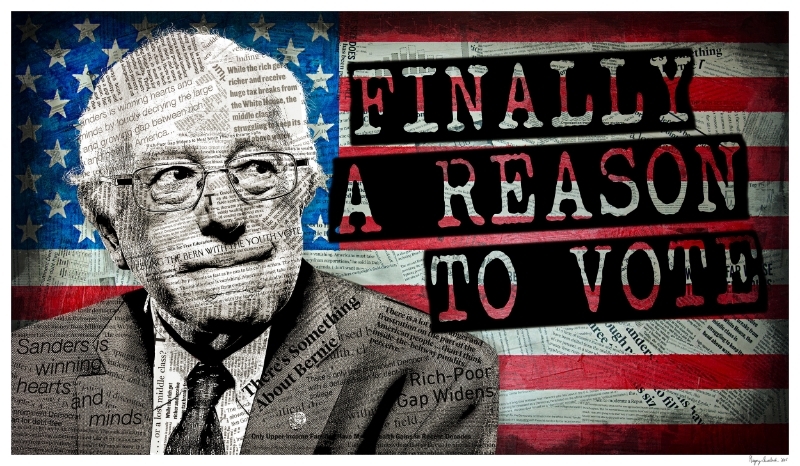 We've already sent over 7,000 posters and banners to Bernie supporters, businesses and democratic organizations to help spread the word that Bernie is not only electable, but the ideal candidate to bring our country forward and upward. Go to www.gofundme.com/bernieart to donate. "I feel like I’ve spent my whole life trying to stand up for the underdog, those who couldn’t defend themselves, or those who needed a leg up. This time around I’m standing up for a hero. Back in June, I started reading about Bernie Sanders and started mocking up some ideas here and there over the next few months. In August, I had some work to finish and no new projects, so I worked exclusively on those and two Bernie Sanders pieces. At some point, I got in touch with the campaign and got some positive feedback and I kept trucking. I’m thrilled to be a small part of a big thing, and I’m ecstatic to support a man who is giving this country and ALL of it’s people a reason to cheer and hope. Bernie is a man that is looking out for our futures, and actually trying to build a better country for all of the people, not just the corporations and the extremely wealthy. We ran a kickstarter to raise money to send these posters to pro-Bernie organizations around the country for free, and now I'd like you to be able to print your own and show some support in a very crucial time. As far as I’m concerned, he’s the first person running for president in a long time that entirely has the best interest of America at heart and powerful ideas that can not only create positive change, but also as demonstrated, inspire a nation of people to know that they are important and they have a say."